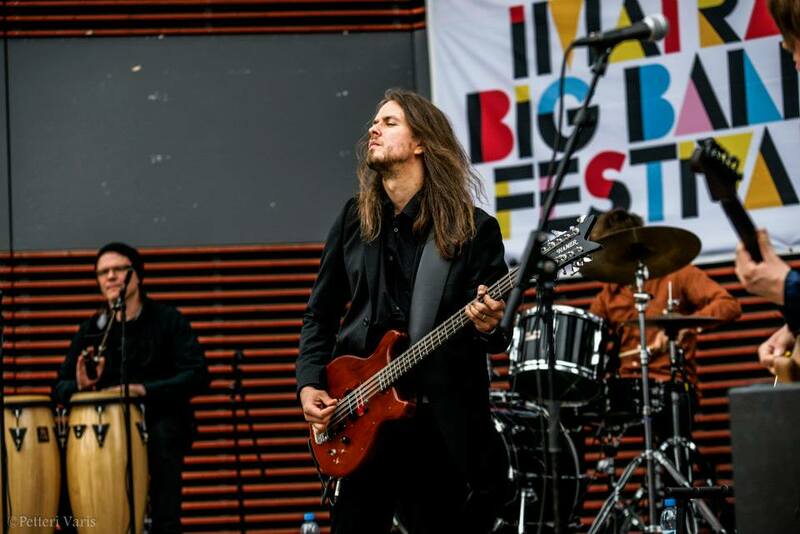 Progressive rock thrives on big bass tones, and by using not one but two 12-string basses on stage and in the studio, Pekka Ranta sets the tone standard that other bassists can only dream about. 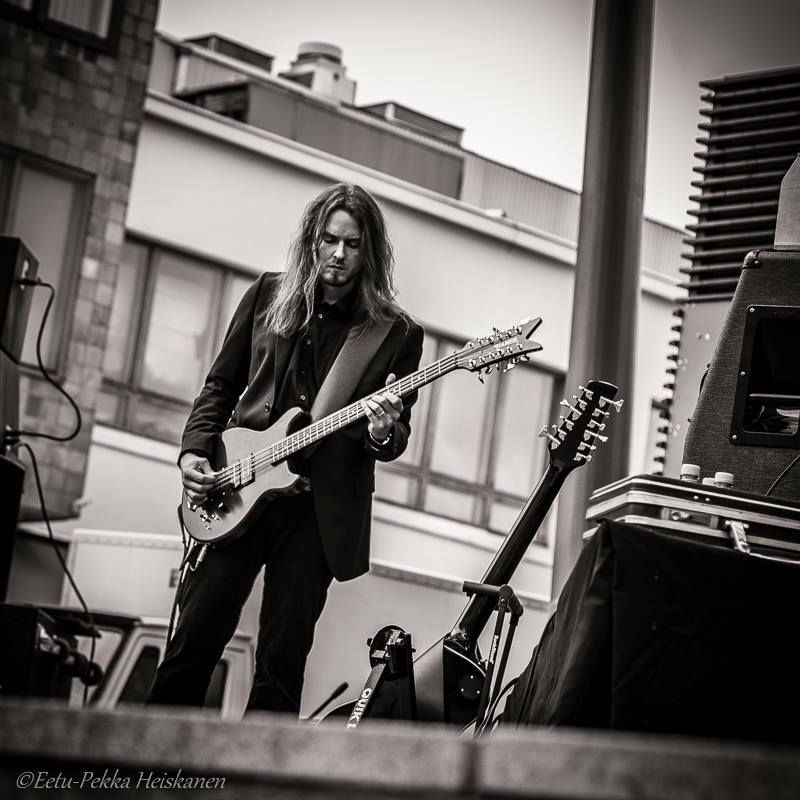 Who is Pekka Ranta? How would you describe yourself? I'm a 40-year old married man and a father of two small boys. I'm a big music fan and a musician, in that order. I live in Imatra, Finland which is a small town in South-East Finland near the Russian border. Imatra a small town but the music scene is quite vibrant. Lots of gigs by local musicians and jam sessions every now and then which I try to attend as much as I can (see the words "married" and "two small boys" above). Very open minded. How long have you been playing bass? What attracted you to the instrument? I started dabbling with it at school in 1988 when I had to play it in some school anniversary thing and also secretly played a bass owned by my sister's friend when she left it at our house. I recall playing along a Black Sabbath tape. I had my own bass in February 1989 and never looked back as they say. It was an Aria Pro II XRB -series with an active P/J pickup configuration. It was a pretty good bass but I never did like its looks (very heavy metal with a pointy headstock and stuff). The shop also had a used Tokai Jazz Bass which in hindsight would have been a much more sensible choice and I might still have it if I had bought that but I didn't like the word "Jazz" so there you go. I'm not sure what attracted me to the bass guitar. I guess I just liked the looks of it. I also recall being surprised that you could play some high notes with it. I thought the bass meant low and only low! How did you first hear about the 12-string bass? I think it was the cover of "At Budokan" where I first saw the Hamer headstock and wondered about the amount of tuners and why some of them where smaller than the others. I had also seen a pic of John Paul Jones' Alembic 8-string that was intriguing for the same reasons and slowly but surely things started to connect. The first time I heard the sound of a 12-string bass was most likely Pearl Jam's "Jeremy" and after that King's X's eponymous fourth album. I read a review of it where 8-string and 12-string basses were mentioned (although Doug Pinnick never used an 8-string as we know now). I recall that you had a 9-string bass. How did that come about? When I got into Cheap Trick in 1997 the desire to own a 12-string bass had gotten very bad but the USA-built Hamer was out of my reach. I naively and not too seriously placed an ad where I wanted to buy some Cheap Trick bootleg videos and also an 8- or 12-string bass. My friend played drums in a band whose bassist Ari Hukkanen was and is a huge Cheap Trick fan and had built and modified some interesting bass guitars. He chanced upon the ad and asked my friend if he knew me. To cut the long story a bit shorter I made friends with Ari and eventually bought his modified early 80's Aria SB700 back in spring 1998. It had 3 fundamental bass strings with double octaves, fully adjustable bridge and EMG electronics and did it sound huge! I used to tune it in dropped-D -tuning (ddD-aaA-ddD) and used it until I acquired my first "proper" 12-string bass in 2001. I still have the Aria, it is now modified as a 6-string bass tuned from E to E like Fender Bass VI or Danelectro six-string basses. The difference is that it is a long scale. Very inspiring instrument and I can still undo the mod and bring it back to its 9-string config if needed. Which 12-string basses do you have? Do you have a favorite? I have a Korean made Hamer CH-12 which I acquired in 2001. I would have wanted a B12A but as it was only made in USA I had no option. As it was the case with my first bass I never liked the looks of the CH-12 but it sounded good. Eventually I had it modded quite radically. A luthier friend built a whole new body for it and after numerous pickup experiments it has now two vintage style Thunderbird pickups which seem to do the trick. My only regret with the mod is that the B12S style body it has now is a little too small for the long scale neck. It might be the only long scale 12-string bass with that Les Paul Jr DC body style and there's a good reason to it! My other 12-string is a Waterstone TP-2 my friend arranged for me straight from NAMM 2004 where Tom Petersson was promoting them. Tom even might have played it! The serial is 120412. It's now modified into stereo with independent outputs for neck and bridge pickups and the bridge pickup has been changed to a Charlie Christian-type pickup made by Rami Hakala. I like them both as different as they are. When I use both the Waterstone is usually tuned to a dropped-D. I used to use the Hamer with only 8-strings but now it's back to normal. What do you enjoy most about the 12-string bass experience? The sound. It overcomes all the hardship it may bring along (multiple amps, expensive strings etc.). Who do you consider as influences? For the 12-string my main influence is Tom Petersson. I also like his 4-string playing and his changing tone from song to song has been an influence (see also Chris Squire). John Paul Jones, John Entwistle and Chris Squire who have used octave stringed basses and also guitarists like David Gilmour whose ringing tone I have tried to emulate and John Martyn whose Echoplex technique I've ripped off without shame. I learned a lot of my picking and muting technique from playing along The Police albums so Sting is definitely an influence and listening and copying other pick players like John Gustafson (Quartermass, Roxy Music etc. ), Max Webster's Dave Myles, Genesis' Mike Rutherford, Wishbone Ash's Martin Turner and Gentle Giant's amazing Ray Shulman have helped a lot with the 12-string too. Roy Wood of The Move had probably the best bass sound ever on "Message From The Country". Although I play the 12-string bass 99% of the time with a pick these (mostly) fingerstyle players have had a lot of influence on my overall bass playing as I use both fingers and pick with the 4-string bass: Geezer Butler (Black Sabbath), Andy Fraser (Free), Geddy Lee (Rush), John Wetton (King Crimson), Pekka Pohjola (Wigwam and solo)and Richard Sinclair (Hatfield & The North), just to mention a few. The late great Doug Rauch (Santana, Lenny White, Cobham etc.) played with a wonderfully fluid sound and very pioneering double thumbing technique which I have tried to emulate and NRBQ bassist Joey Spampinato's upright mimicking Danelectro playing has been an inspiration too. Not to mention Field Music whose Brewis brothers have a knack for great bass lines and wonderfully dirty Fender Mustang sound which also reminds me of Jason Falkner and... I'd better stop now. How frequently do your play your 12 live? Do the other band members encourage you to use a 12? 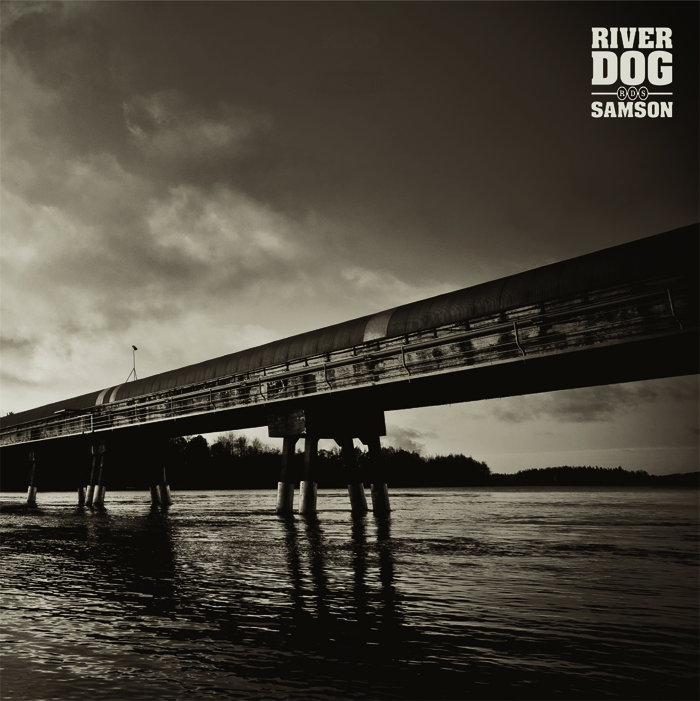 With Riverdog Samson I have the 12-string with me almost without exception. When we started I played it exclusively and only when we started to use drums on gigs I brought a 4-string with me too. A few times when I had to use only a 4-string others felt something was missing. What live performance rig do you use? I use a Hiwatt DR103 100 watt tube amp made in UK in 1977. I bought in in 1997 and it has probably been the best purchase I've ever made. As it is an all-purpose amp it's great for the 12-string and also for effects. Plenty of power and quite hard to break. It's also the most iconic looking amp ever. Just look at those pics of Entwistle, Townshend, Gilmour etc. I also have two old Lab Series transistor heads, models L2 (100W) and L2 (200W). When I can I use either of them for overdrive as they give a very good tube-like distortion with a low volume if needed. It's a very loud amp too and they are still cheap so grab them while you can. My pedalboard consists of stereo-volume pedal, Rotosphere II Leslie simulator, stereo delay and stereo chorus pedals. I split my signal either with a tuner or straight from the bass and both signals ('dry' low-end and 'dirty high-end') go through the stereo volume pedal and stereo delay. The other one goes also through the Leslie pedal which I also use as a pre-amp (it doesn't 'rotate' all the time). If I use only the Hiwatt the low-end is plugged into the normal input and the high-end into the brilliant input. Both have their own volume controls so I can match the signals easily before the master volume control. If I use the LAB Series as a second amp the high-end signal goes to that. The cabinets I use at the moment are an old Hartke XL115 which has an EV 15" speaker and EBS CL112. I also have an Ampeg SVT810E cab but rarely use it with the 12-string. I don't use a lot of distortion. I've found that the Rotosphere pedal is a good pre-amp for the 12-string as it somewhat smoothens the sound which can be a bit harsh when played dry. The Leslie effect with the 12-string is one of my favorites and with the volume and delay I can make it sound almost like an organ. How do the audiences react to the 12? Usually it's the "I don't know what it is but it does sound great". Positively most of the times. The "bass has only 4-strings and must be played with fingers and don't go past the fifth fret" crowd has been almost absent. And I don't care if it increases. You have a great bass sound on your albums. How did you record the 12? Are there any recording secrets that you would like to share? Our guitarist Ville is the main engineer and he rarely uses the DI signal at all. It was recorded in our rehearsal space in Joutseno and in Ville's studio in Helsinki. Ville has studied recording and that helped a lot. The bass was recorded using my Hiwatt DR103 and mic'ed through either Ampeg SVT 810E or EBS 212CL cabs. I also used a Laney Supergroup 100W amp through the EBS cab occasionally. Due to circumstances we couldn't record the whole albums at one session but as a whole I think it took about a month. How frequently do you use the 12 as a songwriting tool? Quite a lot. I'm an abysmal guitar player and don't have a polyphonic keyboard at home (plus I'm bad at that too) so the 12-string is a good tool. Do you have any specific musical goals that you are working towards? I haven't really thought about it. To make a third album and write more lyrics and music. To learn to play some keyboards.